This page is very much a work in progress at the moment, since my amplifier project is in the same state. These are mostly written as notes for my own benefit, (and a kind of reminder of what I am doing, since building in my spare hours takes so much time that it's easy to forget where I got to at the previous stage!). I would certainly welcome any comments or questions anyone might have in the meantime. When I finish the amplifiers I'll tidy up the layout and add some pictures - please be patient and not too critical in the meantime! This design, by Giovanni Stochino, appeared in the April 1997 issue of Electronics & Wireless World, with a final article in August 1998, in which he presented a slightly modified "practical" circuit. These constituted the last of a series of articles in EWW concerned with slew rate, including three technical discussions by Stochino and one by Ben Duncan (April 1995), the latter arguing that most conventional amplifiers didn't cope well either with modern recorded material or with high frequency spurious signals (though some might argue that a lot of modern music falls in the latter category...). Duncan quotes a criterion of Nelson Pass' supporting a minimum slew-free full-power bandwidth of 200kHz (corresponding to a slew rate of 1.4V/us per peak output volt), and praises the subjective treble quality of amplifiers (including his own Rauch DVT!) which are optimised for high slew rate. The circuit is pretty complex, aiming to maximise the speed of the current delivery to the various stages. The slew rate of the amplifier is quoted (simulated and measured) as over 300V/us, and it also provides a pretty low THD figure (whatever correlation that has with the subjective performance...). In the 1997 article Stochino presents a version of the circuit with various capacitors added to improve stability and copious high-voltage signal diodes in critical places, presumably to protect the transistors from momentary reverse biasing. In the latest article he further improves the "user-friendliness" of the circuit with an AC-coupled input stage and a capacitor in the feedback loop to reduce the DC gain to unity, hence minimising the DC offset, which has the potential to be quite high if the input transistors are not well matched. 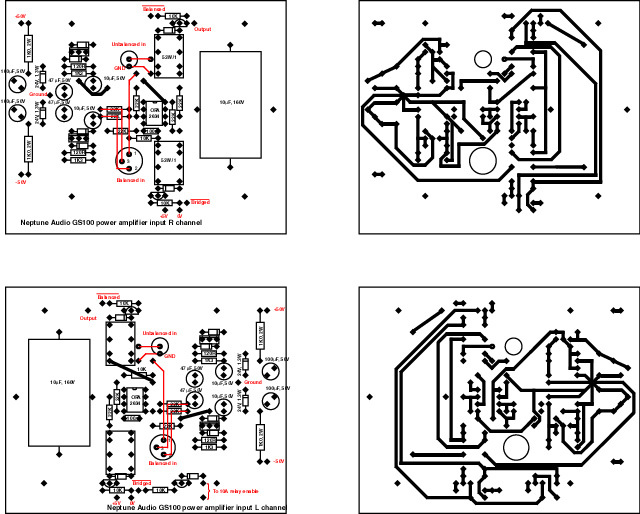 For 100W output it requires two pairs of supply rails, with the output stage fed by +-48V, and the rest of the circuit by a separate regulated +-55V supply, the latter drawing 20mA or less. The doubled-up output MOSFETs (IRF640/9640) are biased to a quiescent current of 150mA each, which means that the amplifier runs hot (7.5W per output device, or 30W total), but it should consequently give a low level of crossover distortion. 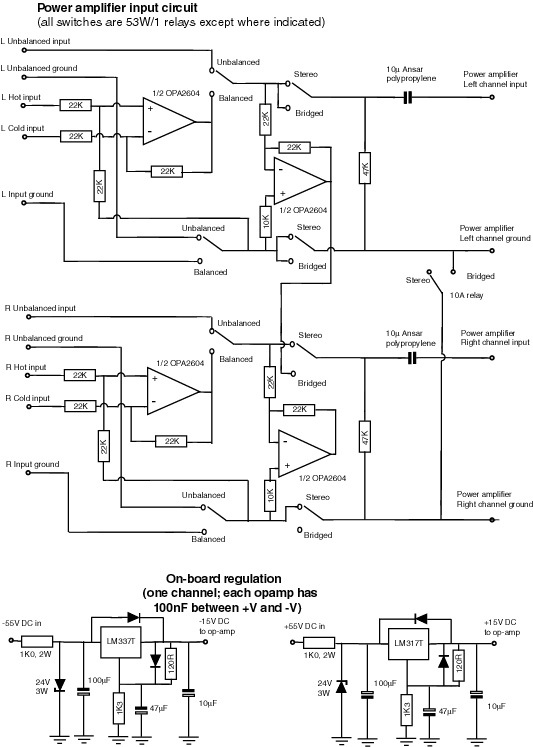 The only caveat with the original design is that it is completely DC-coupled, making it potentially very sensitive to DC offsets in the input signal, and the DC gain is 30dB or so, so the input transistors need to be well-matched to avoid DC at the output. Stochino's revised article adds a series capacitor in the shunt leg of the feedback circuit to give unity gain at DC. I don't like the idea of having an electrolytic capacitor in the signal path, so I'm trying to avoid this by selecting the input transistors for minimum offset. I have installed the capacitors and diodes as in Stochino's revised article, but I will see what happens when I short these out. Stochino also puts back-to-back electrolytics (100uF+100uF) in the input circuit to decouple DC, with a low pass of just under 1Hz. Again, I'm trying to avoid using electrolytics, so I use a 10uF polypropylene at the input, giving a slightly higher -3dB point of 3Hz. Douglas Self has some interesting comments on distortion introduced by electrolytic capacitors: he concludes that this is more significant in the feedback capacitor than in the input decoupling capacitor, since the former carries higher currents. An alternative solution is to use a high-quality audio transformer such as Jensen's JT-11P-1, which would give isolation both from DC offsets and ground noise, as well as providing a balanced input as part of the bargain. This, of course, would not remove internal DC offsets, so is only an appropriate solution when the latter are eliminated. I've been using a couple of power amps based on the Maplin 50W amplifier to drive the woofers of my semi-active speakers. This is a solid but basic design with a low slew rate of 15V/us, and without much real investment to reduce distortion and noise. These work well for the low frequencies, but when I've tried using them full-range they significantly lack the richness and texture of the Croft valve amps I use for the mid and treble of the speakers, and are a little hard in the treble. I decided I was ready to build my "final" amplifier, and wanted a circuit that would be reliable and bomb-proof, and add as little to the sound as possible. By that I mean not just that the amplifier should be subjectively transparent and have a low total distortion and noise, but that it should be well-behaved in adverse conditions, such as high-amplitude transient signals, clipping and radio (and higher) frequency interference. For the same reasons, it should have decent voltage headroom, to stave off clipping in the first place, and a good stiff power supply. On the other hand, I haven't any real need for huge amounts of power, since I use efficient loudspeakers in a smallish room. I own a pair of modified Croft Series 5 valve amps, which I've been using either singly or as a pair for almost ten years now. They are excellent small (25-30W) ultralinear pentode amps with a lovely rich midband, but they're not very powerful, and I've become increasingly aware of a lack of detail in the treble in comparison with other amplifiers. I still fantasise once in a while about building a really nice valve amplifier (something like an Audio Research Classic 60, for instance), but my common sense tells me that I can't really justify the cost of the parts, the room heating or the replacement valves. A good solid-state amplifier won't be quite as seductive, but will be cheaper, more reliable and easier to fix if anything goes wrong. The articles by Duncan and Stochino mentioned above suggested to me that I wanted a high-bandwidth circuit of intelligent design, and the use of MOSFET output devices also pointed toward reliability (although I would rather have the MOSFETS in TO3P packages than in the undersized-looking TO220 ones). There is plenty of heat in the bipolar versus MOSFET debate, but Ben Duncan's recent argument in HFN/RR, that the crossover distortion of FETs is less obnoxious that that from BJTs, is compelling. I'm building a quartet of the Stochino circuits as a pair of stereo chassis to replace the Maplin circuits. This gives me the option to use a pair of channels for the higher frequencies too, though whether they will replace the Crofts will depend on how they sound. I am using the PCBs of Stochino's own design and supplied by EW, but I removed the portion of the board behind the output transistors so that I could attach the PCB directly to the external heatsinks (and of course reconnecting the two power lines that had tracks on the bit I cut off). In the diagrams provided with the PCBs showing the recommended mounting method, the (large) heatsink appears to sit on top of the board, which rules out the use of heatsinks external to the box, and seems a little strange to me. The alternative suggested methods have a 2.5cm square aluminium bar between MOSFETs and heatsink, which would have allowed me to use my heatsinks, but that strikes me as an expensive waste of space and also compromises the heat transfer. The component values are the same as those suggested by Stochino in the construction manual, but with one or two exceptions. I couldn't get hold of 5 ohm resistors, so the emitter degeneration resistors in the current mirrors for the input stages are 4.7 ohms. I found the 1N4448 diodes hard to get hold of, and I replaced them with BAX16 types from Maplin, which have a 150V rating. I used a 47uF SMPS capacitor instead of the specified 22uF 50V electrolytic capacitor (C12), simply because that was what I happened to have. The values of the resistors setting the current through the input stage (R10 and R13) are specified inconsistently in the final article and in the parts list supplied with the PCB: they are 50 ohms in the former and 62 ohms in the latter. I used the larger value, since the DC offset is proportional to the input stage current (62 ohms gives IC=5mA per transistor, compared with 6.5mA with 50 ohms). Actually you can use the usual Thiele-Small parameters to estimate for any given driver how much of a DC offset is tolerable (see my note). 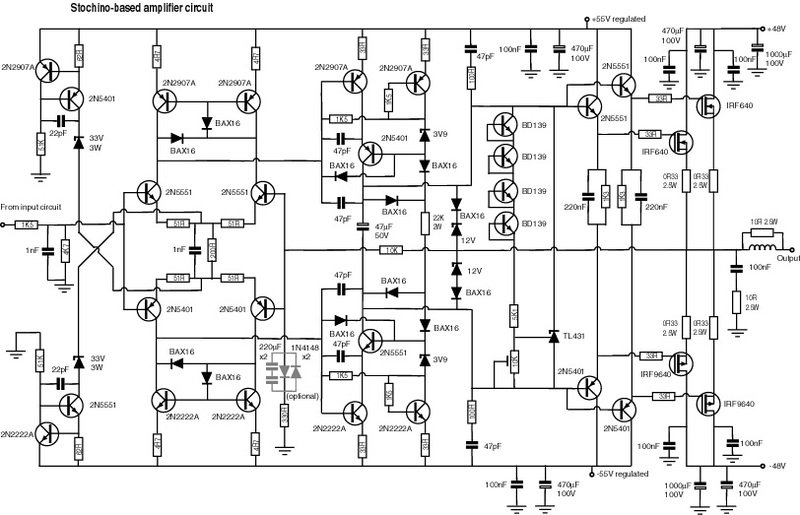 Here is the circuit, with the component values I used. The amps are coming together in a pair of aluminium boxes to match the preamp and active crossover enclosures, but slightly taller and more robust. The MOSFETS are mounted on a pair of Maplin's 10cm high "Multiple TO3" heatsinks (now unfortunately discontinued, but they are selling off their surplus stock half price) per channel, with the heatsinks forming most of the side panels of the boxes, with small pieces of the painted MDF in the corners to match the line level components. These are rated at 1.3oC/W each, giving a combined rating of 0.65oC/W per channel. With a quiescent current of 150mA per MOSFET at a rail voltage of 50V there is a standing dissipation of 30W per channel, or a rise of 20oC or so over ambient temperature while idling. The temperature in our living room rarely gets above 25oC, so this shouldn't be a problem. To give a sense of perspective, by the way, a single Croft Series 5 has a standing power consumption of more than 150W! The heatsinking isn't intended to dissipate the full power of the amplifiers - a continous dissipation of 100W per channel would give a heatsink temperature of 90oC or more, which will probably not blow up the MOSFETS (depending on how efficiently they are coupled to the sinks), but is unacceptable in any practical sense. I am very unlikely to reach this in any situation where the amps are working properly (though I am installing thermal protection - see below), but the headroom will be useful. I thoroughly recommend Rod Elliot's tutorial on heatsink choice and implementation. The power supply and high voltage regulator circuits are more or less the same as recommended in Stochino's August 1998 article, with only a few component values changed (mainly for practical reasons of availability). The PSU is entirely dual mono, with the ground lines of the two channels only shared when bridged mono mode is selected. There is a 500VA toroidal transformer shared by the two channels, with the secondaries rewound to give about 35-0-35V (1.5mm) and 45-0-45V for the two pairs of power rails - I tweaked the windings under load to get 48V and 65V DC, respectively. I originally envisaged using one rewound 500VA toroidal transformer for each channel, but I realised that the two would be too tight a fit, so in the end I wound the secondaries for both channels onto the same core. This gave a pretty bulky mass of copper, which only just fitted into the space allocated, and in fact hardly allowed enough space in the centre of the toroid for the mounting bolt! To finish the transformers off I glued the 8mm x 80mm mounting bolts with epoxy into a plastic tube, itself glued into the centre of the windings, then I taped around the outside of the transformers and finally topped each one off with black epoxy potting compund. The transformers are mounted on the central line of the chassis, on the neoprene disc supplied with the transformer, and with an additional layer of auto sound damping sheet attached to the bottom panel of the amplifier. The smoothing capacitors, rectifiers and regulators are fixed to a pair of 0.5mm copper partitions to each side - these latter give a modicum of screening at high frequencies, but are probably negligible at 50 or 100Hz. All the same, much of the radiated interference from a linear power supply will be at higher harmonics, as a result of the short duration of the charging current pulses, so any screening is useful. Logically, I should put the screening between the reservoir caps and the PCBs, since the former carry high peak currents, although this wouldn't be practical in this case. The transformer primaries each have an RC trap across them, as recommended by Dejan Veselinovic in his article in TNT Magazine to help suppress high-frequency noise, both from PSU itself and from the mains. I'm using over 20,000uF of smoothing for each output stage rail, with a 15,000uF BHC Aerovox paralleled with a 4,700uF Elna Cerafine, and a further 1,500uF and several film caps on the amplifier board close to the output devices, as suggested by Stochino. I originally intended to use high-speed rectifiers BYW98-150 for the high-voltage, low-current supply and BYW80-150 TO220 devices for the output stage. However, I am persuaded by Dejan's argument in TNT Magazine (also quoting Nelson Pass in support) that a high-current bridge rectifier is superior for power amplification stages. 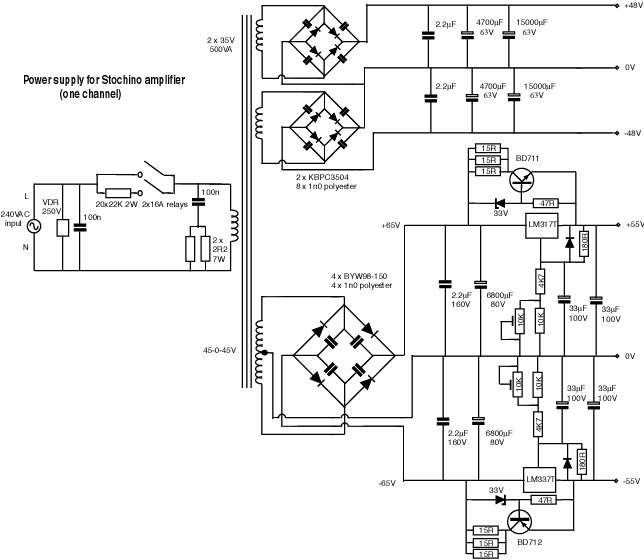 Bridge rectifiers come in electrically isolated packages with much more robust connections than the puny TO220 devices, and of course simplify the wiring. For this reason I'm keeping the BYW98-150 for the relatively low-current voltage amplifier stages, but replacing the high-speed separate rectifiers for the output stages with a 400V 25A bridge for each rail. The low-current supplies have 6800uF of smoothing, and the regulator circuits are attached to the amplifier heatsinks at the sides of the chassis. I'm installing them with a balanced input stage and a switchable inverter circuit to allow them to be used in bridged mono mode (for serious voltage drive!). The input stage is built around an OPA2604 and some 53W/1 sealed relays (as used in my preamp and active crossover) per channel, with a +-15V regulated supply derived from the regulated 55V amplifier supplies. The input mode is selected from the rear of the box, with indicator LEDs for each function on the front panel. This board also includes the 10uF polypropylene coupling capacitor, which replaces the pair of back-to-back electrolytics on the PCB (it's too big for the board). Here is a PCB foil and layout for the two boards (untested - mine are still hardwired on matrix board; also note that the underside foils need to be reversed)). Up to now I have used Maplin's Amplifier Protection Module (now discontinued) to avoid switch-on noises and protect the speaker from problems upstream. The Stochino circuit is fully complementary-symmetric, and has no big capacitor in the feedback loop, so I'm not so worried about switch-on thumps. I would be more relaxed, though, to know that my speakers are protected in the unlikely event of amplifier failure - I've had one, and that was costly enough. On that one occasion the amp also created plenty of black sooty smoke, so it's be nice to have some kind of thermal protection for the rest of my domestic possessions, never mind my audio system! John Murphy has a nice survey of speaker protection methods. I'm not convinced that I really want a relay in series with the speakers and, besides, it's hard to find a high quality relay with contacts rated higher than 30V DC; a relay which is fused solid by an arc from a 50V DC power line is worse than useless. I'm also trying to avoid using fuses either in the power lines or in series with the output. Fuses are notoriously nonlinear devices, with a significant resistance, which is in addition a function of the current. The most transparent and safest solution I know of is to connect the speakers directly to the output, and use a crowbar switch to blow the mains fuse if a fault is detected. Some commercial amplifiers use this method, but I haven't tried it yet. I spent a while trying to work out how to effect the crowbar - a high-current triac is the obvious solution, though it's not obvious to me how to trigger a triac on the 220V mains input by a protection circuit attached to the amplifier output, without some serious safety implications. On the other hand, I already have a relay in the mains supply to the amplifier circuit in the form of my existing slow-start circuit. This inserts a power resistor in series with the mains tranformer to allow the big capacitors to charge up for five seconds or so, then connects the transformer primary directly. I intend to keep the Maplin module, and add an additional relay (16A at 250VAC) which will then be used to disconnect the mains from the signal circuits in the event of a fault. This isn't as failsafe as the crowbar, since once a fuse is blown it stays blown, but the standing current in the output transistors should discharge the reservoir capacitors over a few seconds once the mains is disconnected. Even though this doesn't offer the same degree of protection for the speakers, at least it should prevent the amp catching fire in the event of a fault. I could install a set of power resistors to discharge the capacitors more quickly, but the power involved would require some serious heatsinks (a one-second time constant, for instance, implies a dissipation of 50W per rail, or 200W for a stereo chassis!). I'm using one of Maplin's temperature protection modules, designed to work with the Amplifier Protection Module, for each channel, with a thermistor on each heatsink. There is a LED on the front panel to indicate over-temperature, and one for signal fault (persistent DC, in other words), either of which will trigger the error detection circuit. Apart from the PSU, the components are mostly quite inexpensive and not too exotic (all the bits are available through Maplin or Electromail, for instance). How did I get on building it? How does it sound? Visit the progress report and some photos!